At a speech in Los Angeles on Friday, Mel Watt, director of the Federal Housing Finance Agency, announced that the deadline has been pushed forward to the end of 2016. HAMP uses funds from the Troubled Asset Relief Program (TARP) to pay lenders to modify loans of troubled homeowners, creating more affordable payments. HARP allows borrowers with little or no equity in their home to refinance to a lower-interest rate mortgage. Despite low interest rates and rising home values, many homeowners who could be taking advantage of these programs are not. HARP refinancing has slowed significantly, even though a typical HARP refinance saves a homeowner on average $185 monthly on his mortgage. In February, there was a 60 percent year-over-year decline in HARP loan closings. FHFA has a graphic that shows state by state the number of loans that were eligible for HARP. To determine eligibility, the agency looked at conventional loans originated before June 2009 with an unpaid principal balance greater than 80 percent of the property value. The loans must have no delinquencies in the past six months and no more than one delinquency in the past year. The loan must have a remaining balance greater than $50,000, a term greater than 10 years and an interest rate at least 1.5 percent above market rate. As of December 2014, FHFA found 604,678 homeowners across the country had mortgages that met this criteria and who could be taking advantage of HARP and were not. 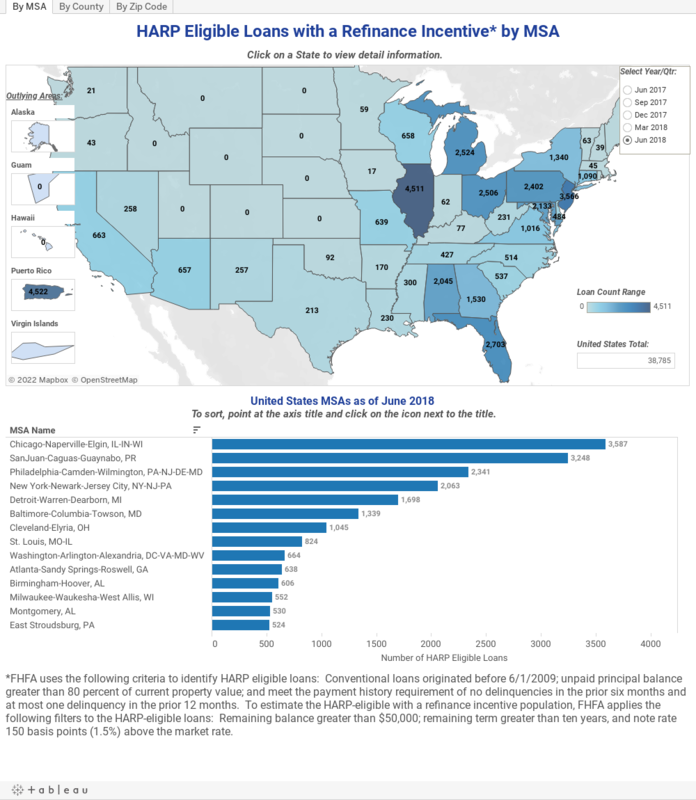 The states with the highest number of HARP eligible loans are Florida (81,422), Illinois (47,783), Michigan (46,302) and Ohio (45,168). Maryland had 17,326 HARP eligible loans, while Virginia had 15,954 HARP eligible loans and the District had 726 HARP eligible loans.